Siddhartha Gautama was born in Lumbini, Nepal as a son of Shuddhodhana, the King of Kapilavastu and his Queen, Mayadevi. Siddhartha was 29, when he left home. For some time, he moved around the country meeting sadhus and saints in his search for inner peace. Six years later he went to Bodgaya near the Neranjana River and sat under a tree. This was the turning point in his quest as he realized that the truth is within every human being and to search for it outside was baseless. He saw how everything, from the smallest speck of dust to the largest star was linked together in a constantly changing pattern: growing, decaying and growing again. Everything was related. Nothing happened without a cause and every cause had an effect on everything else. At long last he found the truth; he attained enlightenment and established the principles of Karma. Now he was the Lord Buddha, the fully liberated one, awakened and enlightened. Lord Gautama now as a Cosmic Master sending the cosmic mind of Buddha to every being on conscious or sun-conscious levels, bring forth peace and relaxation and inner calm, to help personal burnout and to bring forth spirit into our lives with a calming effect on our physical body that integrates through our higher self. 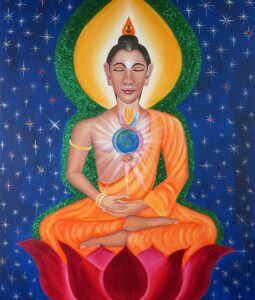 Meditation is in many forms but the techniques that Lord Gautama has given us is to bring peace for mindfulness so we may manifest our truest and highest potential. He is working with his twin flame Quan Yin, she is teaching his light through every civilization with his compassion and understanding for the awakening for the golden age, 2032. He is sitting cross legged in meditation within the stars of the cosmos around him. His Buddha mind focused with the golden flame around him. His heart is focused on our world, with the 3 folding flames of Love appearing around our world. This threefold flame, sustain-er of our physical life and a sacred trinity of love, wisdom and power, is placed in our hearts at birth and is withdrawn at transition. They become balanced, expand, accelerate and swirl as we gain mastery.